In the 1500’s, when Cortes landed on the shores with his men to begin his conquest over the Aztecs, it is reported that he burnt the ships that had brought them there. His intent was to help his men understand that it was win or die…no retreat. They were committed! In the 1900’s, on March 29th, 1975, we landed on the shores of holy matrimony. To seal our commitment to one another, we did what Cortes did. 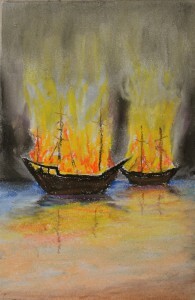 We burnt the ships…and we don’t regret it in the least! It’s been an incredible 43 years together! 25 years ago, Mike and I married in Raleigh, NC, and we are still on this exciting journey of partnership together. 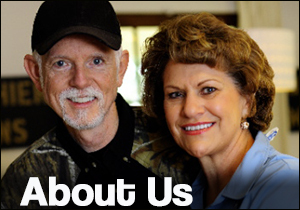 Thank you, Steve and Annie for ministering to us over the years. When we were newly married, and stationed in Minot, North Dakota, we had the privilege of hearing a concert from the Chapmans. Steve and Annie’s emphasis on an enduring commitment to marriage struck a chord with us. The song “The Ships are Burning” was especially meaningful for us, because we knew that a promise before God was sacred, and that our marriage vows were not just based upon feelings or circumstances. On our 25th anniversary, we took the day off to have a celebration. While driving back home from Virginia Beach, we played some old favorites, and “The Ships Are Burning” was sung as a duet together, right there in our car. Personally, I think it was beautiful…because we still remain committed to each other. Our love still grows sweeter each year, seasoned with lives pains and pleasures, and through God’s grace and mercy. Thank you so much, Steve and Annie for your faithfulness and passion for harmony in the home. How encouraging and uplifting this song is for all life situations! The words were used in a wedding in CA yesterday! There were single people, married, divorced people attending the wedding and I know it touched many hearts. Thank you for helping people in all different types of situations. We will celebrate 54 yrs of marriage this October and have been through so many difficult hardships along with the mountaintops experiences, but, the words of this song touched our hearts ! Thank You! Your songs have been a blessing to my husband and I for many, many years. We met you in person many years ago when we attended one of your concerts in Syracuse, New York. At that time we were conducting a marriage ministry called Caring For Marriage, do you remember? My husband is now very ill and isn’t expected to live for many more weeks, but God knows. Can I purchase a The Ships are Burning CD from you rather than streaming? We appreciate your message and thanks for being a friend through the music through the years. Regarding your husband’s health struggles we hope that others who read your note will lift him in in prayer as we have done. Please keep us posted. What an awesomely meaningful song this is about the commitment marriage is between a husband and wife. 21 years ago my wife and I had this song sung at our wedding and it the only one that we really remeber from that day. We have a niece getting married this year and I would like to sing for her do you know where I might get an accompaniment track. Thanks for the song and your ministry. As a wedding coordinator, I have this song in my repertoire under “commitment.” This song has so much truth to it!! Thank you for recording this song. I was wondering though, did you ever produce sheet music for this song? I read music and play by ear, but every so often I has a request for this sheet music and all I can produce is just a lyric lead sheet. Would love to purchase the sheet music if it is available. Thank you!! So sorry thet the sheet music is not available. We offer a guitar tablature that can be sent via email. No cost. We offer an accompaniment track if needed. To get it, email us at the address on our contact page and we will tell you how to order it. This past wknd our daughter married a Godly young man that was raised on this song. I had heard it before, but he heard it every night for many years growing up. When he proposed he played this song, & told her this is what he wanted for them. In their wedding, while they branded a cord of 3 strands this song was played again. When I looked up this song tonight I saw this picture for the first time. Do you know where I can get a copy of it? We would love to gift them one. Thank you.